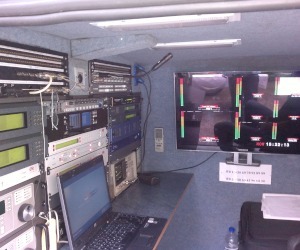 ARISTON BTS successfully completed the implementation of ENGS’ third DSNG vehicle. The van used is a ΜERCEDES VITO. 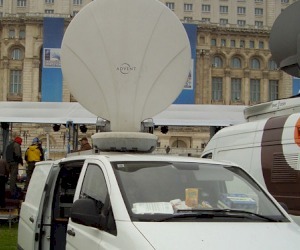 The satellite part of the installation consists of one 1.5m antenna by ADVENT, XICOM amplifier and TANDBERG encoder. There is the option for a second transmission chain (1+1 transmission) or MCPC transmission (up to 3 programs). The baseband system (full SDI with embedded audio) includes SPG, router and multiviewer by EVERTZ, CRYSTAL VISION interfaces and VTRs by SONY & PANASONIC, in order to cover the entire spectrum of recording formats. A notable innovation is the use of an EVERTZ VIP8 multiviewer which covers all of the van’s source monitoring needs.